Garlic Green Beans with incredible flavour are the perfect and easiest accompaniment to any main meal. Only 5 ingredients to get you hooked! 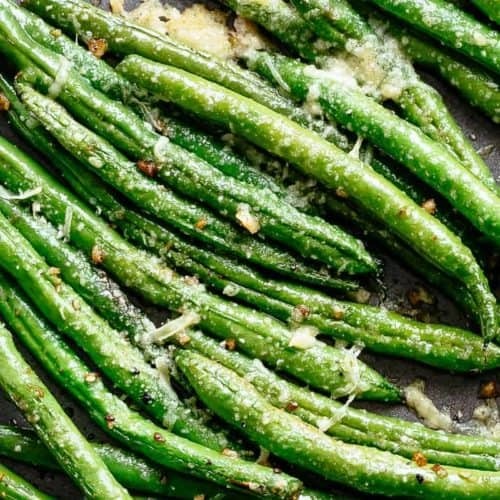 Olive oil and crispy parmesan cheese smothered garlic green beans roasted to make a quick delicious snack or an incredible side dish! Ready to be served with absolutely anything. Something essential to have a quick and easy side dish in your cooking library is a side that goes with chicken, fish, lamb, beef. A veggie to enjoy as a healthy snack in between meals: garlic green beans are perfect for any situation. Parmesan cheese (Romano cheese, Asiago or Manchego can also be used). 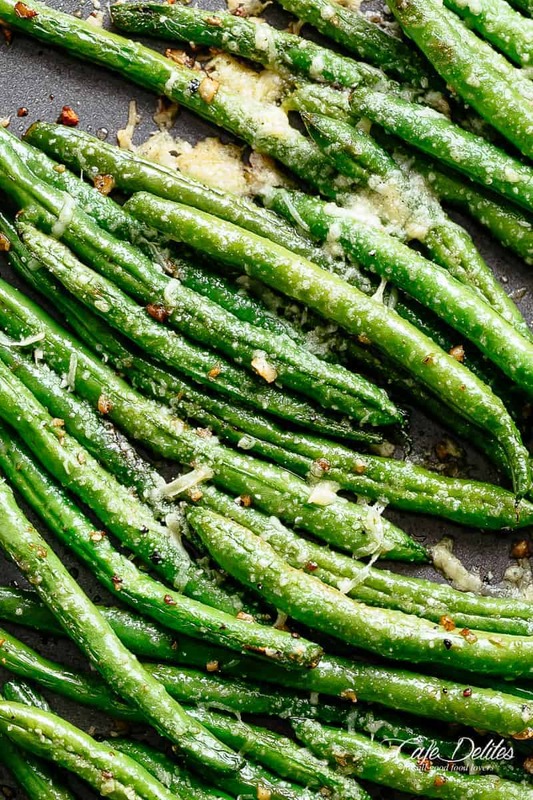 This garlic green beans recipe is extremely forgiving and versatile. Completely make it your own and have the best green beans on the table in no time. Spice them up with a shake of Cayenne, chili powder or curry powder (leave out the parmesan if going with that last option). WHAT TO EAT WITH GREEN BEANS? 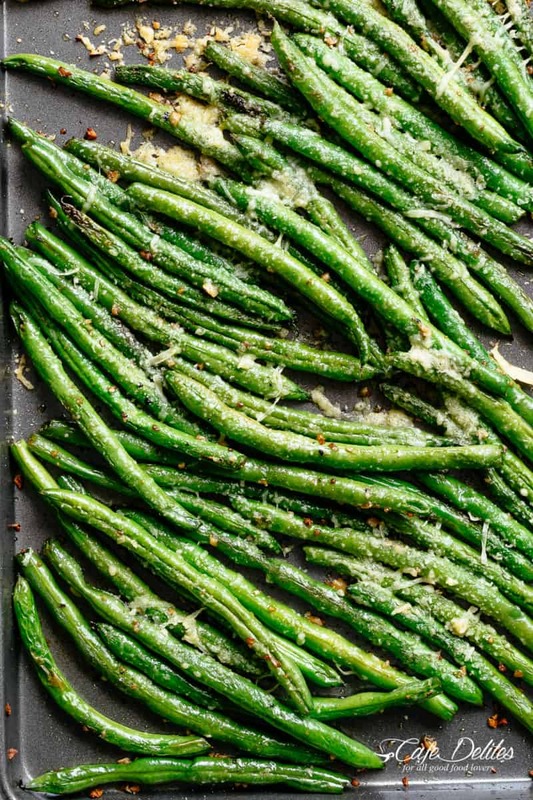 The beauty of garlic green beans is that they go with absolutely anything. Whatever you choose to serve them with, you will love this ease and taste of this recipe. GET OUT OF YOUR GREEN BEANS RUT WITH MORE GREEN BEAN RECIPES! Roasted Garlic Green Beans with incredible flavour are the perfect and easiest accompaniment to any main meal! Only 5 ingredients to get you hooked, this Roasted Green Beans recipe is so easy to make. An incredible side dish ready to be served with absolutely anything. A quick side to throw together or make them into a delicious snack! Preheat the oven to 220°C (425°F). Lightly spray a baking sheet or tray with cooking oil spray. Arrange the green beans in one layer on baking sheet. Drizzle with oil and season with salt, pepper, garlic and parmesan. Toss beans to evenly coat. Roast in the oven for 20-25 minutes, tossing halfway through cooking time, until fork tender. Remove from oven, season with extra salt and pepper to taste. Sprinkle over with parsley and serve. I am going to try this because I am tired of serving green beans the regular way. This sounds delicious, must make it.